The Poinsettia Fire has burned approximately 100 acres and several homes in Carlsbad, north of San Diego. The Associated Press is reporting 30 homes have now burned as a result of the brush fire that first sparked early Wednesday and has threatened homes, schools and even popular tourist destinations. The County of San Diego proclaimed a local emergency due to at least five wildland fires burning, including Carlsbad, Fallbrook and Camp Pendleton. AlertSanDiego reports it has notified 15,000 homes, businesses and cell phones to evacuate in the city of Carlsbad. Officers are using loudspeakers to make mandatory evacuation orders in the area. Authorities are asking residents to heed the warning and leave the area if asked. The evacuation boundaries are west of El Fuerte Road, south of Palomar Airport Road, north of Aviara Parkway and west to the coast. An NBC 7 News crew captured video of a home located along Black Rail Road near Sapphire that had sufffered some damage to its roof. Flames were bearing down on Aviara Oaks Middle School Wednesday afternoon as winds fueled the fire that sparked just before 11 a.m.
Carlsbad police officers said the Poinsettia Fire sparked around 10:40 a.m. at Alicante and Poinsettia Lane and moved quickly. In less than an hour, a line of flames were burning toward El Camino Real near Poinsettia Lane and Jasper Way. Two men - who identified themselves as Ryan and Adam – were going door to door in the area east of Blackrail Road to knock on doors and help people evacuate. One homeowner was panicked as the palm trees in her backyard were engulfed in flames, they said. Residents from the Cassia Heights apartments were evacuated. Calavera Hills Community Center, 2997 Glasgow, is being opened as a shelter location. Pets are welcome. Poinsettia Elementary is currently being evacuated to Carrillo Elementary School at 2875 Poinsettia Lane, San Marcos. Aviara Oaks Elementary and Middle schools are being evacuated to the Sunrise Retirement Community on Manzanita Street Carlsbad. Fire helicopters are making water drops on the flames. Westfield Plaza Camino Real is serving as a temporary evacuation point for people and animals according to police. Park Hyatt Aviara, located just a few miles from where the fire sparked, was under mandatory evacuated. Guests and staff were under mandatory evacuations, a staff member told NBC 7. Earlier in the day, La Costa Resort said their number one priority is keep guests calm. LEGOLAND California posted a message to its Facebook page saying the park had to evacuate rides because of power outages caused by fires. Callaway Golf and Titlelist Golf were evacuated as well according to employees who spoke with an NBC 7 news crew. Diane Wood, Carlsbad resident, said she is approximately two to three miles from the location of the fire. “It’s rather threatening. Everyone is coming out of their businesses and looking as the smoke is approaching their area,” she said. “It’s pretty scary,” Wood said. San Diego Gas & Electric reported that it has shut off power to some customers in San Diego County for public safety purposes. For the latest information on where outages are occurring, visit SDG&E’s outage map. 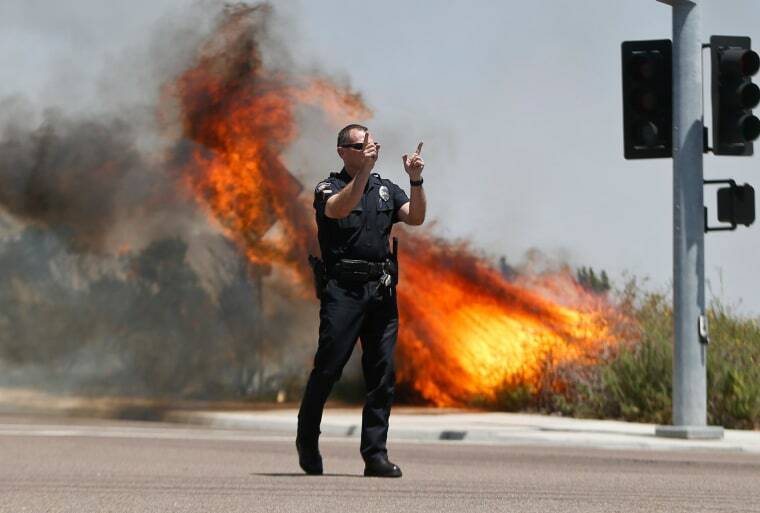 Due to the fast-burning fire burning in the Carlsbad, several transmission lines tripped offline. Approximately 3,000 SDG&E customers were out of service due to the fire. Crews are working to restore power as soon as it is safe to do so, the utility said in a statement.